Do you hate typing in the dark? Well, this might be what you are looking for. Logitech’s Wireless Illuminated Keyboard K800, announced last month, offers wireless connectivity and back-lighting in a sleek package. Although regular typists probably don’t need any help finding keys, having some assistance when finger typing in the dark is often handy. While it’s great that back-lit keyboards are becoming common additions to the latest generation of laptops, finding a full-sized external keyboard with the same feature is rare. The K800 is an exception. The keyboard even uses Logitech’s standard “Unifying” pairing system making it possible to use a single micro-receiver for multiple compatible accessories. I was a bit worried about battery life since the wireless aspect and the lighting will consume power quickly, but Logitech offers some extra features to mitigate the issue. An ambient light sensor automatically adjusts the back-lit brightness to appropriate levels only when dark. A motion sensor checks for proximity of your hands and only enables lighting when approaching. Despite those power-saving techniques, Logitech’s website claims a battery life of only 10 days. That’s a fairly short time frame considering that other wireless keyboards last up to months on a single set of batteries. Fortunately, having to go through boxes of batteries isn’t an issue. The K800 features a microUSB port and comes with a cable for recharging an internal battery. 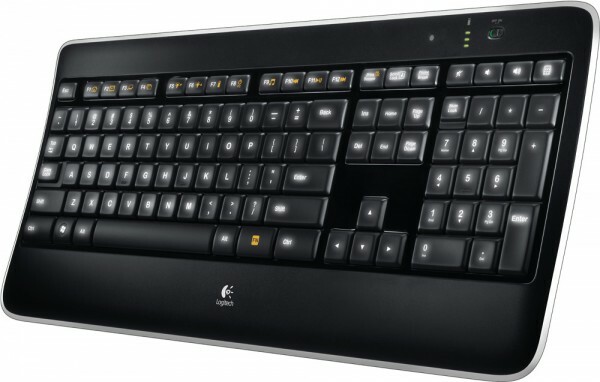 According to Logitech, the Wireless Illuminated Keyboard K800 hasn’t started shipping yet. However, it is available for pre-order from Amazon.com and Logitech’s website. The MSRP places it at $99. We’ll try to get our hands on a unit for a full review, so stay tuned.